The Saginaw Chippewa Anishinabe Ogitchedaw Veteran and Warrior Society will be recognizing Women Warriors during the Annual Veterans Feast on Saturday, November 8, 2014. Those Tribal and community member Women Veterans or those in active duty are asked to send a military photo and/or current photo with Name, Branch of Service and years served. Photo not required but requested. Digital photos only and please send as an attachment. The Anishinabe Ogitchedaw Veteran and Warrior Society has a representative in our office weekly to help assist veterans who are seeking benefits from the Department of Veterans Affairs with their paperwork. 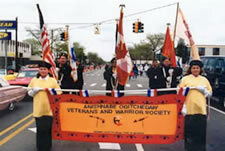 Daniel A. Ashcraft, national service officer with the Military Order of the Purple Heart, said the non-profit group chartered by the U.S. Congress is there to represent all veterans. "A lot of people dealing with the federal government on their own get confused with all the paperwork," he explained. "There are seven pages of instruction with the normal application for compensation or pension. They can be easily overwhelmed. Most vets will say "to heck with that." Ashcraft added there is no charge for his assistance and he will be in the Tribal Operations office from 9:30 a.m. to 3:30 p.m. on Thursdays. The Purple Heart, established by General George Washington in 1782, is a combat decoration awarded to individuals who are either wounded in times of war or are killed in action or die from wounds received in action. The Military Order of the Purple Heart was formed in 1932 for the protection and mutual interest of all who received the decoration. Ashcraft said he was awarded the purple heart after being wounded in Dong Ha, Vietnam. He served in the U.S. Marines from 1963 to 1967.